Major changes to your landscape like grading, drainage, tree removal or tree transplanting can be traumatic but sometimes necessary for the health and beauty of your landscape or as a part of a new landscape design. Premier’s landscape construction team is attentive to the unique nature of disruptive changes to your property. At Premier we focus on safety both of our people and our equipment. 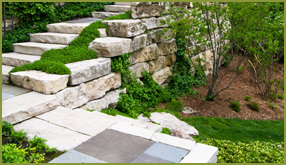 We are insured and specially trained to perform landscape construction of this nature.